Where should you keep a computer tower? A CPU holder keeps your computer up and off the floor where it is safe from spills and less susceptible to dust accumulation. 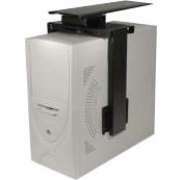 With your computer tower secured at an accessible height on a computer tower stand, you no longer have to stretch to insert disks or switch the power on and off. Make sure the CPU tower stand you choose fits your space. Some of our CPU stands have different attachment options, so you can choose your ideal arrangement. For your convenience, many of our computer tables and desks have the option of a built-in CPU shelf as well. Do I really need a CPU stand? When you are arranging your computer lab or office, you have to take all of the components of each computer into consideration. CPU placement is critical if you want your space to look nice and be functional. If you put your CPUs on the desktops, that will take up work space and minimize the room you have for accessories such as a mouse, keyboard and speakers, not to mention cluttering up your space and creating a hazard. When a CPU is placed on the floor under the table, it can dominate legroom. All of these issues can be solved, while your CPU remains accessible with the purchase of a computer tower stand. A CPU holder keeps your computer positioned properly to maximize space both on the work surface and under the table. A CPU stand is useful in any professional or educational setting. Whether your students are playing educational video games, learning programming or working on a project, having the CPU positioned properly will make the whole process much smoother. In a computer lab where there are many desktops in a row, it can be tricky to figure out which CPU corresponds to each monitor. However, when a CPU holder is mounted to the corresponding table, it is easy to recognize which screen it is attached to. How can I make my desk more organized? If you are concerned about ensuring that your office has a professional appearance, you need to make sure that your desks are arranged in an organized fashion. When computer components are arranged in a haphazard way, an office can look messy and disorganized. A computer holder that is built into the executive desk creates a neat and efficient workspace that reflects professional expertise. When you have computer carts in schools or offices you have to keep all components of your desktop in one place. If parts of the computer don&apos;t have a place on a cart, they might get lost in the shuffle or damaged. In order to ensure that your CPU always travels with a monitor and keyboard, it is a good idea to attach an under desk computer mount to your computer cart. With this arrangement, nothing will be lost or forgotten, even when a desktop has to be moved quickly or without warning. What is the best place for a CPU holder? The ideal placement for a CPU shelf depends on the arrangement of rooms and furniture. This convenient accessory can be mounted to the inside or outside of a table leg. Mounting on the outside of the leg maintains open leg room under the work surface. Mounting on the inside of the leg prevents tripping because there won&apos;t be anything bulky sticking out from the table. Another option that is available with certain models including the Quattro table from Bretford is to have a compartment that rests in the bridge between attached desks. A fully ergonomic work space has to have every component of the desktop in the proper position. In order to eliminate stretching and maneuvering that is often required to access buttons and disk drives, it is important to ensure that the CPU is in the proper position. If it rests on the floor, it will often be out of easy reach. Computer tower holders keep disk drives and buttons at an accessible height, so no one will have to stretch in order to reach. For the utmost in flexibility, tray a swivel CPU holder. This versatile setup enables any part of the computer tower to be accessed for hookups, plug-ins or adjustments. It facilitates better cable management and easy access to data ports for a smooth work day and computer experience. Hertz Furniture has the computer-friendly accessories you need to have an efficient office, computer lab or computer cart. A CPU holder or computer tower stand helps your space stay organized, attractive and functional. If you need help determining the ideal CPU stand arrangement or model for your office, contact the Hertz Design Center for free project-planning advice.